Happy Tamil New Year (Puthandu) 2019 Wishes Images, Quotes, Status, Wallpaper, SMS, Messages, Photos: Puthandu is the first day of the Tamil new year and is widely celebrated in Tamil Nadu and Sri Lanka. Happy Tamil New Year 2019 Wishes Images, Quotes, Status: This year, Puthandu falls on April 14. Happy Tamil New Year (Puthandu) 2019 Wishes Images, Quotes, Status, Wallpaper, SMS, Messages, Photos: Much like every year, people in Tamil Nadu are busy making preparations to celebrate Puthandu (Tamil for new year). The day will be celebrated on April 14. As per the lunisolar Hindu calendar’s solar cycle, Puthandu is the first day of the Tamil new year and it is a public holiday in both Tamil Nadu and Sri Lanka. On this day, Tamilians around the world unite in celebrating the new year. Houses are cleaned, prayers are offered to the gods and a lavish spread is prepared. In case you are away from family, you can send these wishes to your loved ones. Happy Tamil New Year 2019 Wishes Images, Quotes, Status: Happy Puthandu! (Designed by Rajan Sharma/The Indian Express)*May this new year bring all the goodness in your life. Happy Tamil New Year to all. * Let this Puthandu be the beginning of a better life. 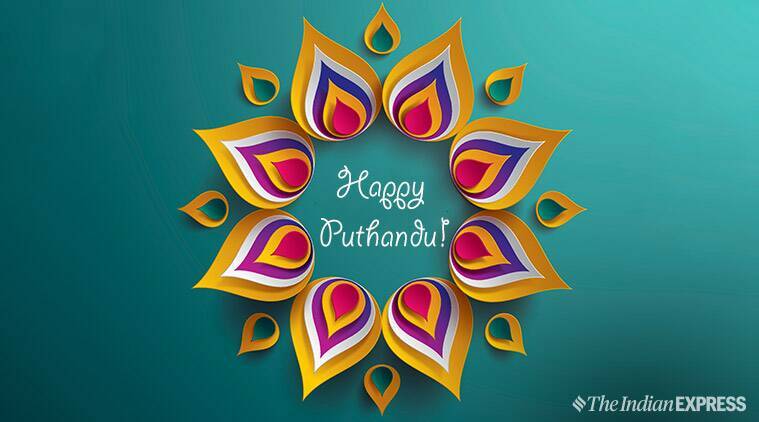 *Have a happy and blessed Puthandu! *Happy Puthandu! Let this new year end all sorrow and bring light and joy. *May this auspicious day bring prosperity and joy!